BestSaveForYou is a browser extension which is presented in a very alluring manner on bestsaveforyou.info. This website promotes a tool which is meant to provide you with the latest news on the hottest deals. Unfortunately, in reality this application offers a whole lot of nothing. Instead of presenting authentic and beneficial saving deals, coupons, etc., it displays random ads which are unlikely to have anything to do with secure online shopping. This is the main reason why you should remove BestSaveForYou from the operating system as soon as possible. 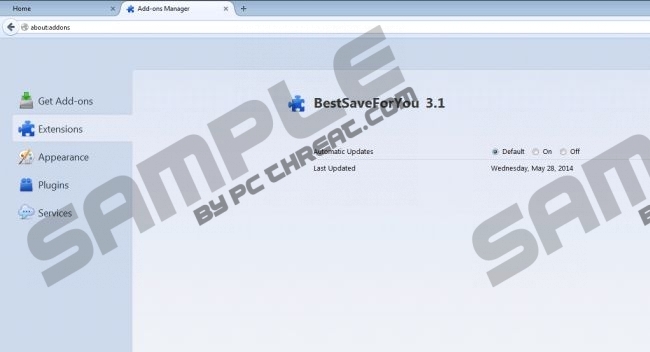 Even though the installer of BestSaveForYou is not presented in an official manner, malware researchers have discovered that it could be attached to other installers. Software bundling is a method often used by highly suspicious software distributors who often support unreliable application in return of some money. For example, BestSaveForYou can be presented when using the installRex installer which does not have the best reputation because of the previously distributed Happy2Save, YTBlockerApp and UTUobEAdaBlock. Note that once installed, the application can be presented using different name variations (e.g., BeiSteSavEFOOrYou). BestSaveForYou removal is important if you want to ensure that potentially misleading ads stop flooding the browsers. Even though some choose to delete the application manually, we strongly recommend trusting automatic malware removal software with this task. It is highly possible that other disturbing programs, adware and PUPs are running on the PC together with the extension, and some of them may hide creating serious manual removal obstacles. Post a comment below if you have questions or personal observations about the advertisement supported program and its removal. Click the Start button on the Task Bar to open the Windows menu. In the appeared list click the undesirable program and select Remove. Click the Start menu icon located on the left of the Task Bar. Quick & tested solution for BestSaveForYou removal.